Any idea when the extra channels may be legal? I saw an advert a couple of months ago for (I think) dPMR in the band - but it referred to being able to access 8 new frequencies. I suspect it's just sales spin that as there were 8 frequencies before, an extra 8 new ones are available, without mentioning there are two in each old 12.5KHz slot. The fact this is missing from OFCOM's site makes me wonder if due to Brexit, it will be implemented here? It's a Euro-decision, so will it or won't it become law here? Yeah i was thinking the same as we are not fully out of europe yet so i think it will still go ahead. with a channel plan based on 12.5 kHz spacing where the lowest carrier frequency is 446.00625 MHz"
Has somebody tinkered with that? The notion of a calling channel is totally alien to the original purpose of the band, very short range, peer to peer - NOT a CB type allocation. I've never seen an OFCOM document with a 'children's channel' - as it's completely unregulated and designed to be. Where has this calling channel come from? That suggests OFCOM/CEPT have totally changed their view. Nobody needs a calling channel to talk to the same small group of people? paulears wrote: Has somebody tinkered with that? The notion of a calling channel is totally alien to the original purpose of the band, very short range, peer to peer - NOT a CB type allocation. I've never seen an OFCOM document with a 'children's channel' - as it's completely unregulated and designed to be. Where has this calling channel come from? That suggests OFCOM/CEPT have totally changed their view. Nobody needs a calling channel to talk to the same small group of people? Those comments are not official designations. They are only comments added by a private individual. 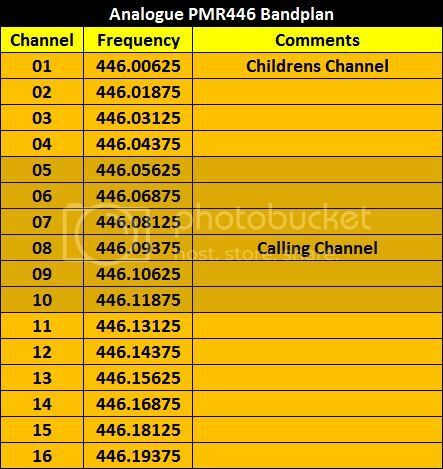 Channel 8 was esablished as a calling channel for 'serious' PMR446 operators over 15 years ago. It is of course no more official than channel 19 on the UK40 or 27.555 SSB....! Ha Ha love this and it is so true. CH 1 through 6 is business here but every weekend on CH 1 are some high pitched kids. CH 2 here is some shop ladies clothing and shoes. Ch 3 some lorry lads at the depot. CH 4 Is Sport Direct. CH 5 some more lorry lads at a depot. I always use 5 or 7 as they are dead most of the time.